Guru Guru - "Moshi Moshi"
In the most recent version of space/psych/acid attack veterans Guru Guru we have old time member Mani Neumeier on drums, percussion, and vocals, Roland Schaeffer on sax, guitar, and vocals, Peter Kuhmstedt on bass and vocals, and Luigi Archetti on guitar and vocals. I think they should have just called this The Mani Neumeier Project or something like that. 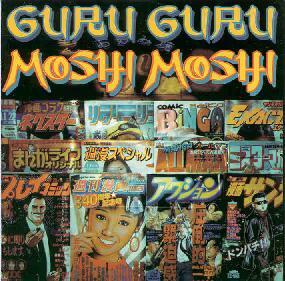 Virtually no trace of the influential Guru Guru style is present. This is a straight ahead rock and fusion album, albeit a good one, but nothing for AI readers to get excited about. Well... "Skylab" is a spacey tune with some freaky guitar and sounds but it's pretty low key and out of place compared to the rest of the tracks. The one thing that really saves this disc is the prominent role played by the sax and we do get some good rockin' fusion in places like "Tamil Nadu", which features sax and guitar trading licks. "Il Maestroso" reminded me of the soundtrack from some Latin detective film noir if you can imagine that. And Mani's percussion work is varied and interesting throughout. I think these guys are really shooting for radio play as evidenced by several dull rocking tunes. "Jet Lag" and "Inkarnation - Stomp" are two of the offenders. But when the band decides to rock out in fusion territory we see that they can play interesting music if they really want to. My favorite tune is probably "Don't Worry About The Koto" which features... you guessed it, koto! And according to the credits Mani is playing it. This is a laid back ambient piece in which the koto plays along with a simple prominent bass line and an Eastern sounding guitar in the background. Like I said, this isn't a bad album. I just don't think it's of any interest to space/psych fans. If you want to hear a really killer album from a Guru in the 90's grab Axe Genrich's "Wave Cut". Now that's a monster! You can visit Guru Guru at their web site.